Every single year since I became an adult, Christmas has compressed the time (from October to December) into a wee little chunk not bigger than a light snack. When I was 8 years old, 10 days until Christmas seemed to take forever. Now, 10 days fly by in what feels like ten minutes. I scramble to hold on a little longer. Fingers digging in. It’s a desperate attempted to slow it down a little. I’ll brobably break a nail. 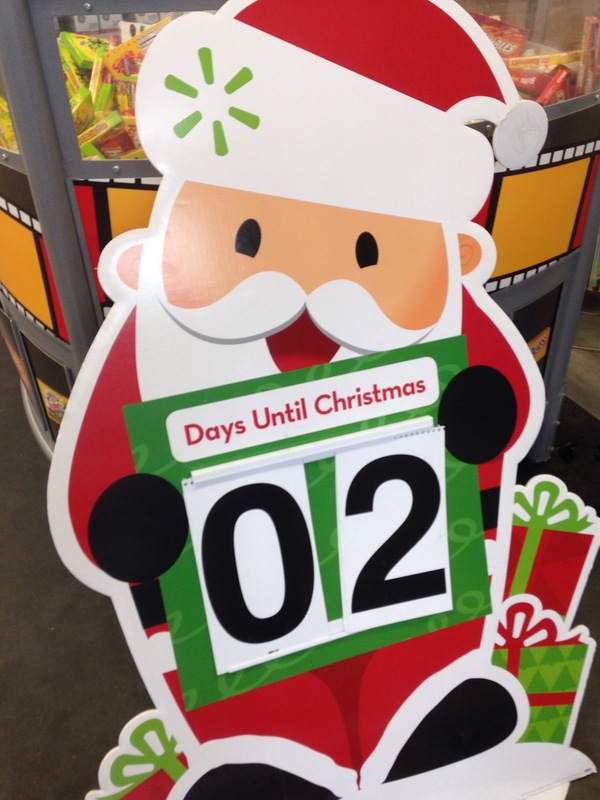 Two days ago, I was running errands and I took a photo of a sign at a store screaming out that it was only 2 days ’til Christmas. I felt angst. Now, all the things I wasn’t sure I’d get done — all the things I’d planned to do — are either done or not done. Fixed in time for Christmas of 2015. It’s unusually warm this year. Our indoor temperature was 80 for a while. Chocolate truffles melted on the inside. My daughter and I visited Santa yesterday. A camera crew intetviewed the big man just before our turn. Then they got shot of my lovely daughter with Santa. We’ve been going to see him for the past 11 years. He’s s great Santa and always so nice. So It was fun to see her with him on the news channel’s website. Oh, the weather outside is frightful [-ly] warm, but the fan is so delightful. And since we’ve no place to go [yet], let it blow, let it blow, let it blow. This may very well be the warmest Christmas I’ve ever experienced. No matter what the temperature on the outside, though, spending time with family and loved ones always feels good on the inside. We hope your day was a good one filled with many blessings. In other news, seeing as time was nice and squished this week, I figured, “what the heck,” and tried to squeeze even more stuff in. Probably not enough room in this chunk of time for more. Invariably, I drop the ball (or at least “a ball” or, even more accurately, several balls) because of this type of cramming. This week I dropped the tea ball (among others). I missed posting a Tea-for-Tuesday tea review. It was Thursday before I realized I’d zipped past Tuesday and was planted in Wednesday. Oops, missed my turn. So next Tuesday it will be. Enjoy until then. I’m so glad I tried this one. I almost passed it up. Sultry Strawberry is so much of what I want in a strawberry tea. There is strawberry flavor along with a soft earthiness as if you can taste the strawberry seeds still on the fruit and a strawberry leaf or two slipped through when you took a bite. It contains a blend of black teas which are going to brew a darker and stronger tea than white, green, or oolong. But it holds up well to the strawberry flavor while not overpowering it as long as you don’t steep the tea for too long. It makes for a nice balance. This tea contains organic black teas, organic licorice root, natural favors, and organic strawberry flavors. There are no strawberry bits that I can see. Don’t let the licorice in the ingredients fool you — licorice root tastes nothing like black licorice candy. Black licorice candy tastes more like anise. Real licorice tastes sweet, earthy, and very slightly nutty. There is no anise flavor. The licorice works really well here. I think this is where some of that subtle earthy flavor comes from. Licorice root contains a component that is naturally sweet with virtually zero calories. It’s not candy sweet but soft, like a sip of fruit slices in water. Not found in this tea is hibiscus. I like hibiscus — maybe even love it — but it is found in so many fruit teas. It can be overpowering. It’s nice to find a good fruit tea without it. 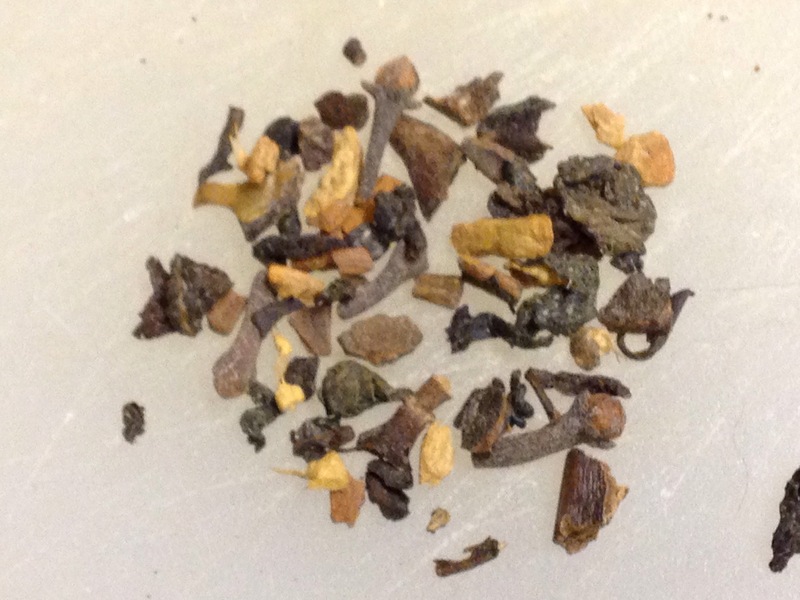 This tea comes in bags, and the flavor holds up well even in a large cup with a lot of water. Since it’s organic it costs a little more than non-organic Tazo teas, but at about $4 to $5 for 20 filter bags, it’s still reasonable. I found this at Whole Foods. I can’t find it in all stores. But this has become one of my favorite Tazo teas ever. I’ll be on the lookout to find it on sale again. 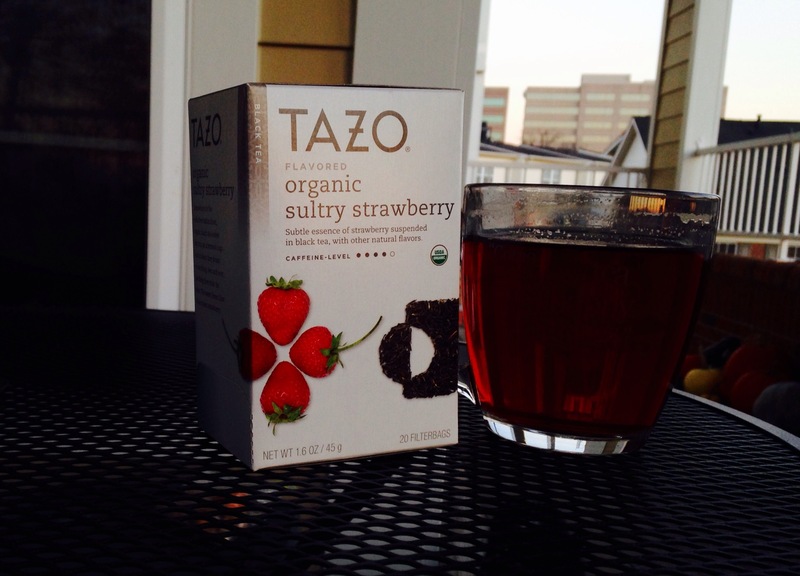 I could drink a lot of Tazo’s Sultry Strawberry tea. I didn’t get as much done on my story as I wanted, but I definitely learned that I can push to do more than I think I can. I’m continuing to push. This is a good life skill. 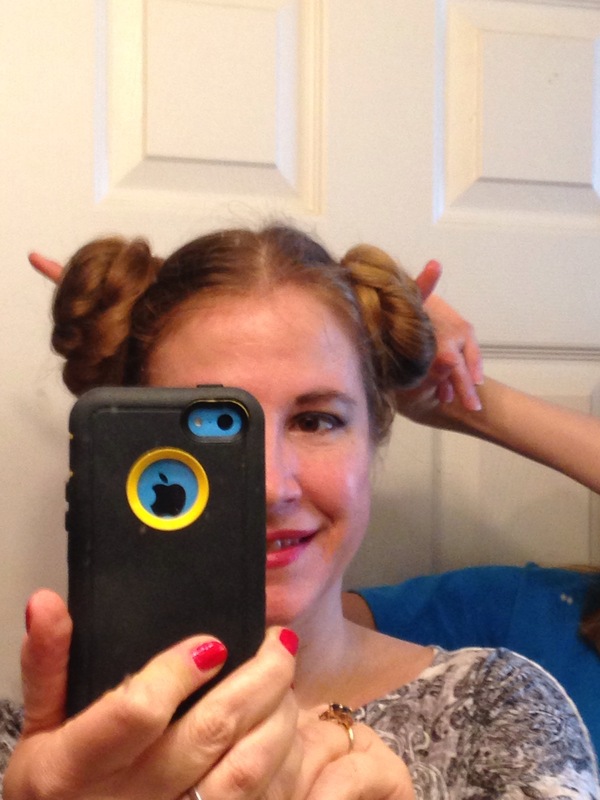 I purchased a domain name to go with this blog. 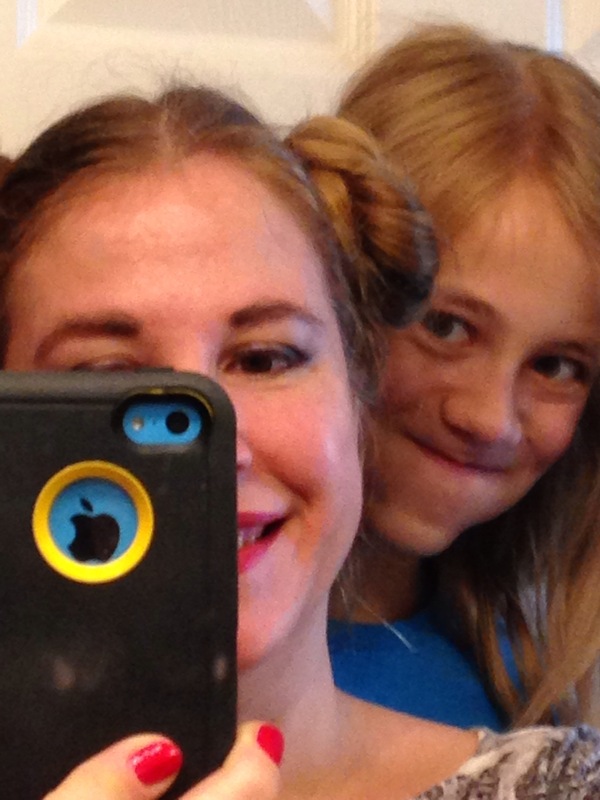 You can now visit alightningbug.org. The old alightningbug.wordpress.com will still bring you here too. I took a little break from Tea for Tuesday this week. But I plan to continue it every other week going forward into December. Join us again soon for something yummy.